Return to the AREA ORGANS page. The Grande Page theatre organ at Stephenson High School was the first of the Page Company’s crown jewel, four-manual organs. It was originally installed in 1927 at the WHT radio studios of the Wrigley Building in downtown Chicago. It was said to be the largest such organ ever built for a radio studio. In 1929, the WHT Page was moved to the Michigan Theatre in the town of Flint, Michigan, where it entertained theatre audiences until 1950. Later it was removed and installed in a handful of personal residences. In 1977, the late Richard Weber (a member of the Atlanta Chapter) acquired the Page to be used in a proposed pizza restaurant in Atlanta. However a different organ was ultimately installed in the restaurant, and the organ was stored in a warehouse owned by Winn Sound in Atlanta. Ultimately, the observations that “the organ probably would take up less space put together” led to the installation of the organ in the warehouse. The organ soon became the center of activity for the Atlanta Chapter of ATOS and was played by numerous internationally-known theatre organists. The dedicatory concert was performed by Dennis James. Lyn Larsen, Tom Helms, Carlo Curley, Kurt Von Shakel, and others also played the instrument. Saturday night jam sessions were well attended and featured Atlanta radio station WSB personality and Fox Theatre house organist Bob Van Camp. On occasion, Hector Olivera, then an Atlanta resident, would drop by and entertain the audience. 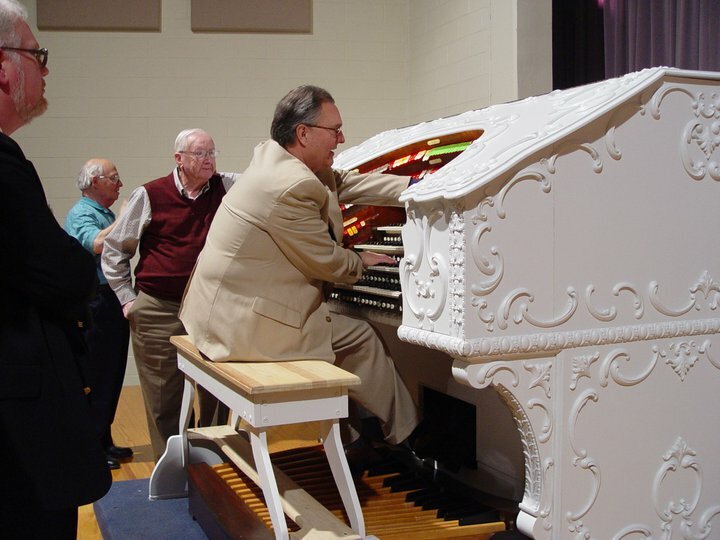 The organ was also used for special holiday gatherings and in some productions of a local amateur theatre group in the capable hands of Bob Fountain. After a couple of moves to other warehouse locations for Winn Sound, the organ was purchased by Mr. Winn in 1991 and donated to the Atlanta Chapter, at which point it was removed from the warehouse and stored in trucks at a local business. Through the late 1980s and early 1990s, efforts were made to find a home for the Grande Page. It was that time that chapter member Jack Sandow emerged as the champion of the unique instrument. He approached his friend, Dr. James Hallford, Superintendent of Schools of DeKalb County, who expressed interest in having a theatre organ placed in one of the county’s high schools. Chapter members toured existing schools but were unable to locate a suitable facility for the pipe organ. At the time, Stephenson High School in Stone Mountain was in the design stage. In 1992, a meeting was held between officials of DeKalb County School Systems and members of the Board of Directors of the Atlanta Chapter. The school system agreed to make building modifications to a planned 500 seat theatre in the new Stephenson High School, to include chamber space, an organ pit, organ console storage area, blower accommodations, and electrical and wind conduits. Jack Sandow became the project leader after the initial meeting and worked closely with Beers Construction Company and the school system’s engineers as design and construction progressed. During the years when the high school and arts auditorium were under construction, the Page was moved to the Gainesville, Georgia business of the late George Whitmire where restorative work began. The console resided for a time at the home of Atlanta organ builder and theatre historian John Tanner. Jack Sandow began re-leathering and rebuilding the Page chests in the basement of his home. Once the auditorium became available, members of the Atlanta Chapter began the installation. Both Lyn Larsen and Hector Olivera performed concerts at the school (on electronic instruments) in support of the installation. During the planning and initial installation, the Atlanta Chapter raised approximately $50,000 and expended countless volunteer hours on the project. As the installation proceeded, the frames were built, the chests installed, and the pipes and percussions put in place in the two chambers, along with a 10 hp two-stage Spencer Orgoblo pipe organ blower to supply the wind for the organ. Through the generosity of John Tanner, a two-manual console was provided which enabled the main chamber to be played. The original Page console has been stripped of its eighty years of paint, possibly as many as seven coats, new stoprails have been built and new keyboards prepared. Through the generosity of a chapter member, several thousands of dollars were provided for a computerized relay to replace the 17-foot-long electro-pneumatic relay. Work has continued on the Grande Page over the years, with substantial progress being made in preparation for the 2013 ATOS National Convention which featured the organ in its closing concert. A formal dedication concert for the organ was presented on April 3, 2014, with renowned organist Jelani Eddington. A landmark fundraising campaign which began in 2013 has raised over $70,000 to assist in completing the installation. The Atlanta Chapter’s Page Crew has been working tirelessly on installing the remaining ranks in preparation for tonal finishing in the very near future.